Last week, at the Los Angeles Convention Center, Blog World Expo appeared in its fifth incarnation. I spent a couple of days watching, listening, and engaging with a dense concentration of experienced and enthusiastic new media evangelists. The keynotes were well done. Peter Shankman is hilarious and gifted. Amber Naslund shared passionately and enthusiastically her observation and exaltations to the digerati to change the future of business. However, the keynote address that arguably provided the most valuable insights and takeawys was provided by Shani Higgins, CEO of Technorati as she shared findings from Technorati’s “State of the Blogosphere” report. 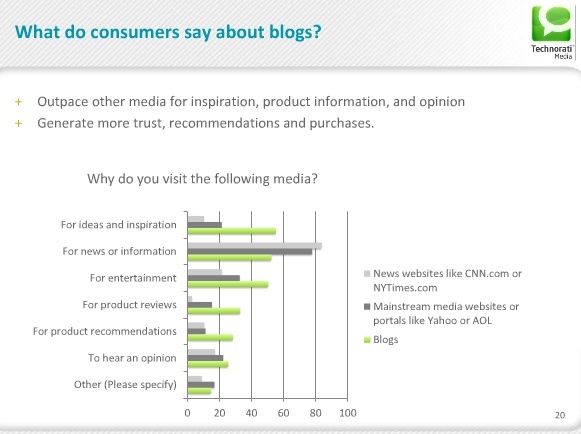 Passion, networking, and sharing are primary drivers behind what bloggers are doing, as evidenced in the slide above. One of the most interesting findings is that consumers prefer blogs for nearly every reason over news websites and mainstream media (see below). Overall, the passion and genuine pursuit of the interests of bloggers creates more trust and is the first place consumers go to learn about what interests them. 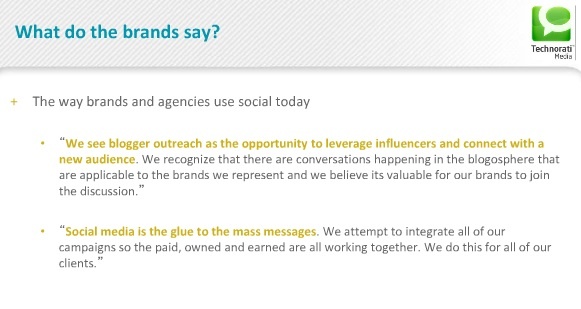 However, instead of becoming more genuine and passionate themselves, brands seem to still be operating in a 1.0 world seeing bloggers as individuals to be leveraged for the distribution of the brand message (see below). It will be very interesting to see if the social web genuinely evolves as the platform of the empowered customer, or if the major brands once again seek to control the channel for branded information distribution – an interesting mega theme for the next decade. For an answer to the megatheme question asked above, you might find a clue by finding what some brands recognize “that there really is no such thing as message control”. One respondent envisions a world where “social media will act as a campaign leader, rather than a supporter”, and greater fragmentation will continue to emerge as a challenge for brands and advertisers. 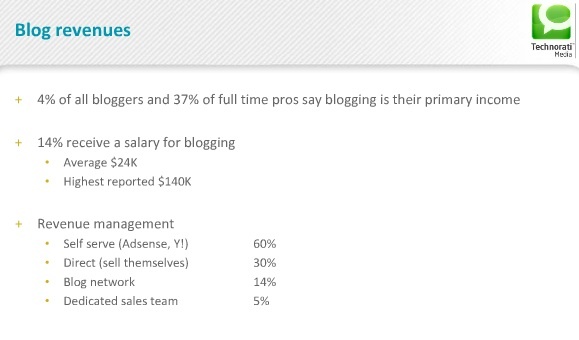 The fact that only 4% of bloggers use blogging as their primary income and the average salary amongst full time bloggers is $24,000 may give pause to anyone looking to make the full time jump. However, for those who are interested in improving their blogging efforts and results, Darren Rowse offered some sage advice from one of the leaders in the blogging business. Darren Rowse is known to many as ProBlogger. During his session, he shared a great blend of stories from personal experience, coupled with sage advice and best practices as how success in a blogger’s world comes from a perfect blend of blogging from the heart (fuel and find your passion), while also being smart enough to generate revenue and make it worth the time and effort involved. The more passionate you are, the more passionate your audience will be. However, a focus on engagement, monetization, and revenue will help sustain you over the long run, as countless hours of pouring your heart, soul, and mind into anything without any tangible return inevitably leads to burnout and disillusionment. If you treat it like a business; set goals, know your readers, build your brand, create hooks, create great products, market effectively, and continually experiment, test and tweak your approach, then there is a place for you on the widening road filled with the next generation of citizen journalists, and the barriers to entry are virtually non-existant. Bestselling authors and entrepreneurs, Chris Brogan and Guy Kawasaki riffed for a bit on Google+ and whether businesses and brands should spend any time there. Ironically, today (November 7) Google+ made pages available to brands for the first time. Quickly after their announcement, pages from Burberry, Dell, and The New York Times hit the network, and thousands more are springing up as you read this. Guy Kawasaki highlighted several reasons why he believes in the future of the newest social network, and he’s placing a big bet with his time. He highlighted one striking difference between Google+ and Facebook: While Facebook is about connecting and sharing with those you know, Google+ is for discovering those you don’t quite know yet around topics of interest and passion. When Kawasaki got 50 intelligent comments on his first post, he nearly abandoned Twitter and has been putting in several hours each day manually reading, commenting, and sharing new stuff on Google+. His overarching view on the network currently is that it is a landgrab. He’s paying the price now to build his tribe. In return, to date, he has nearly 300,000 followers, partially do to the fact that he is a recommended user for those just signing up for the first time on Google+. Chris Brogan largely agreed, and has actually already written a book on the subject. He likened Google+ today to Twitter in 2006, and Chris likes leveraging Circles functionality for segmenting those he is following. Circles gives the ability for users to narrow the stream based on topics and segmentation of users, whether you’re mutually connected with them or not. He also likes to push messages to certain circles. From my perspective, it’s a mechanism of targeted messaging, instead of blasting everything to everyone. Another major consideration that both Brogan and Kawasaki mentioned is that Google search indexes Google+ content right away, while it does not index Twitter or Facebook posts. Brogan shared that his biggest piece of advice was to go back to your Google+ About page and work on your profile, as it will help you connect with others that are looking for what you can offer. From my perspective, Google+ is early in its adoption. Today, it IS mostly filled with tech pundits, authors, speakers, and personalities. The masses aren’t on it yet, and don’t see a reason to be. For those who understand the power of networks – connectors, marketers, and those that have or are trying to build strong personal brands, spending time on Google+ is a calculated bet that the company that intends to organize the world’s information will be able to layer Google+ on top and within a growing suite of ubiquitous tools and capabilities that reach deep into our lives (Google Apps, GMail, Android, etc.) The bet holds significant promise (as well as some risk) as the potential payoff will largely come down the road, if at all. One of my favorite sessions of the conference was led by Matt Ridings and Chuck Hemann and focused on the subject of influence. It’s a topic I’ve been giving quite a bit of thought to, over the past couple of years, and even more so recently, as shared in my recent post: “In search of: A meaningful measure of Influence” . Online influence and reputation are two concepts that will become central to the way the world works over the next decade. Their session triggered some additional thoughts, which I’ll publish in a follow up to this post. My observations and research indicate that there is plenty of confusion in the marketplace about what these new mediums mean for business. Most execs are interested in learning more about how trends in human communication are shifting, what it means at the macro scale, and ultimately what it means for their companies, and respective customer and prospect communities. Today, most executives are swimming in a sea of noise and data, trying to grasp what these new realities really mean, how much weight and attention to give them, and how it should impact how they communicate within their organization and to their customers, suppliers, and other stakeholders. The tectonic shifts under way not only require organizations to shift to listen to what their customers are saying, but also will allow those who truly understand how to leverage new media to gain market share by leveraging network effects that social channels provide. Sadly, however, there appears to still be a significant gap between the evangelism taking place amongst the digerati and the understanding and support of executives. The conference had its share of valuable insights to be learned, but was also rich with hyperbole and ephemeral euphemisms that have no tangible connection to the core practicalities of business leaders today. We are largely in an experimental phase, with some success stories emerging, but most case studies highlighting some very successful individual outliers, or celebrated measurements sitting on the fringe of significant tangible impact to the enterprise. We will begin to see this shift dramatically over the next 2-5 years. While many business leaders seek to understand the new media and communication frontiers, many of the digerati who understand the channel and tools well, still struggle with connecting the dots to meaningful business value. Those that understand both and can bridge the gap between the two will be in high demand now and into the foreseeable future.